Fairly soon after I had performed in Kaite O’Reilly’s play ‘Cosy’ at the Wales Millennium Centre in 2016 we were discussing Shakespearean roles played by women. Kaite then surprised me by saying she would love to work with me on a re-working of Richard III. I said yes immediately but didn’t think much more about it until Phillip Zarrilli, the Director of the Llanarth Group approached me and said he was going to apply to ACW for a production grant. Before I knew it I was dressed in armour at the Battle of Bosworth re-enactment with Kaite and film maker Paul Whittaker. We spent the day filming the soldiers’ camps and the battle and talking to the likes of Lord Stanley and Welsh mercenaries, their knowledge of the history of the 15th century is impressive. We also met members of the Richard III Society who were pressing upon us the importance of portraying the historical Richard, not Shakespeare’s monster. Researching the history of Richard has been extremely enlightening, especially when it comes to the involvement of the Welsh. It was recorded soon afterwards that Rhys ap Thomas from Llandeilo was the soldier who killed Richard with a blow to the head from his halberd, not surprisingly making him very popular with Henry Tudor. Kaite has interwoven some of the history into her script, adding another layer to Richard’s story. This is the first time I have done a solo show and don’t think anyone other than Kaite would have taken the risk! Kaite and I first met over 30 years ago when we were both working with Graeae Theatre Company in London. However it was when I started work with Disability Arts Cymru in 2007 that Kaite and I began to work together on a variety of projects. Kaite is DAC’s Patron and has run many workshops for us over the years. In 2008 she suggested DAC supported myself, our then Director Maggie Hampton, and DAC member Kay Jenkins to undertake a rehearsed reading of her award winning play, ‘Peeling’. At that point I hadn’t done any performing for some time and I am very grateful to Disability Arts Cymru for the support they have given me since then to be involved in other projects. In 2012 I was fortunate to be Emerging Director on Kaite’s piece, ‘In Water I’m Weightless’ for National Theatre Wales, directed by John E McGrath. This came out of a body of work Kaite had been working on for some time called ‘The ‘d’ monologues’ and was a wonderful experience. Kaite is currently working on the Singapore ‘d’ monologues, ‘And Suddenly I Disappear’. This is an Unlimited commission and will be performed in Singapore in May and the UK in September, so it’s proving to be quite a year. Back to Richard…. Performing a solo show is a challenge but also a huge privilege. To be the one person on stage telling a story that is important, funny and personal is like nothing I have ever done before. The team around me though are extremely supportive and it doesn’t feel like I am on my own. Over the years I have admired actors who perform solo shows; Helen Griffin, Gareth John Bale, and have wondered why they have put themselves through the agony of learning all those lines, but I am beginning to understand the pull. There is a definite freedom in performing on your own and not having to worry about what anyone else is doing, it’s scary but a good scary. 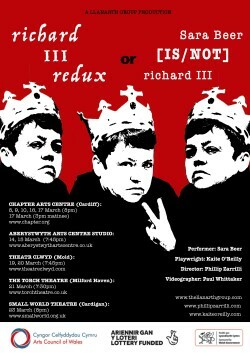 I play three personas in Richard III redux; the one that is closest to the actual me, an actor trying to find a way to create her interpretation of Richard for a production, and an actor playing Richard. 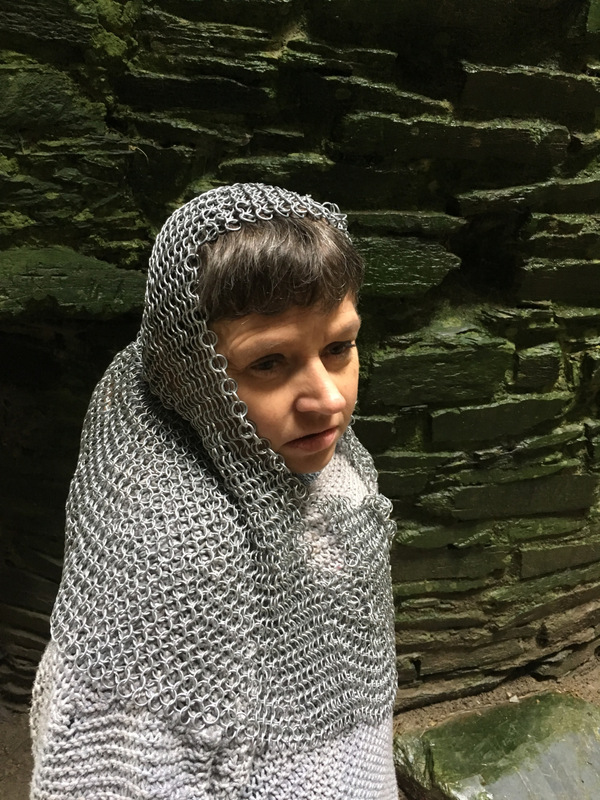 We wanted to explore the ways non-disabled actors have portrayed Shakespeare’s Richard over the years and turn that on its head. We have all been reading Anthony Sher’s ‘The Year of the King’ and watching numerous videos of past productions. We are finding a balance between a light-hearted look at how some actors take themselves so seriously when creating a role and the more serious message of disabled people always being portrayed as villains. We are using video in the production to enhance the storytelling and to give me the opportunity to talk to myself! I am having a lot of fun and I want the audience to have fun too but I also want them to leave the theatre with plenty to think about.